The powerful capabilities of Java allow for the use of this software platform in the development of truly effective solutions for business. Cross-platform and built-in security features, a combination of functionality and ease of use are features that stimulate the high demand for Java technology-based application development. We offer a full range of Java development services using the latest technologies, based on the Agile methodology. We also have a high level of interaction transparency. Lvivity is a team of Java-development experts with many years of experience in the successful development of products of varying scope and complexity levels. 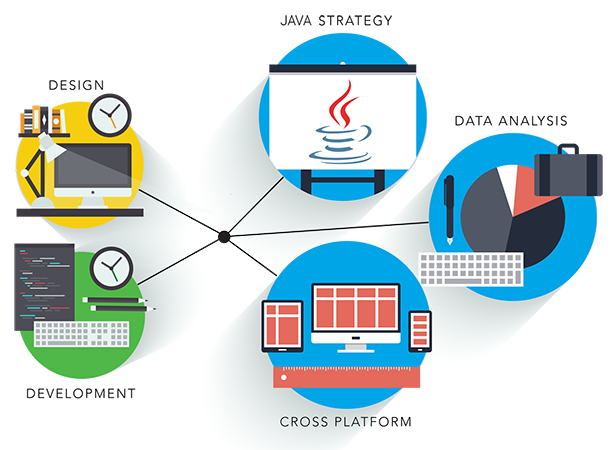 Custom Java Development Based on this platform, you can deploy productive and feature-rich websites with a high level of security, as well as apps for desktops and mobile operating systems. Versatility, scalability, and flexibility make Java the best choice for business requirements. Java Migration Service Old tech-based software support can be a complex and expensive task. The migration of your product to Java will be completely arranged for you, which will reduce costs and provide better prospects in the future. Java Consulting Qualitative consultations and support are no less important than the development itself. Our specialists can help you successfully complete a complex project’s platform, solve performance and integration problems, and any other tasks that you might encounter in the product development process. Enterprise Java Development Deploying Java-based solutions focused on meeting the enterprise’s needs allows you to streamline the workflow, as well as effectively and consistently stimulating business growth. Compatible with new or updated versions, the code written for one Java-version will continue to work consistently on later versions. Lvivity offers advantageous Java development services, which ensures high-quality work thanks to a team of result-oriented professionals. We have extensive experience in successful app development for different business sectors, and we are ready to help you realize the most daring and innovative ideas!